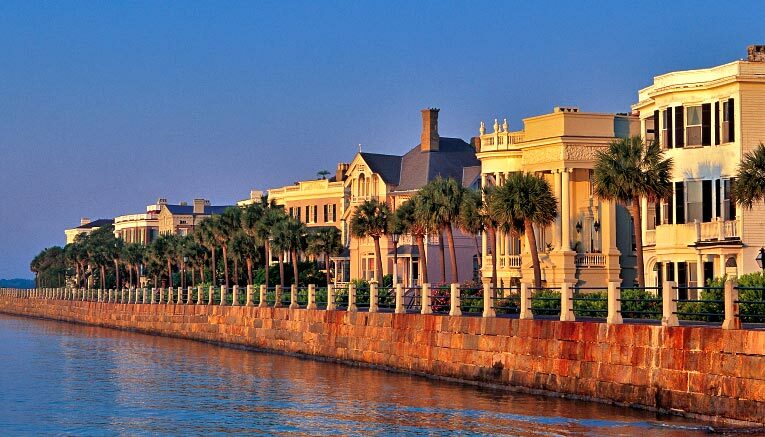 With its pretty, pastel buildings, cobbled streets and quaint trolleys, it's hard to believe Charleston was once a pirate-infested hotbed of debauchery described as the “Sodom and Gomorrah of the south”. Three hundred years later the South Carolina town is better described by the other labels it's since been given, including America's “best mannered”, “sexiest”, “friendliest” and “best dressed” city, the “most polite and hospitable city”, the “most haunted city” and “home to America's most attractive people”. Take just three days there and you'll discover this tropical, seaside gem is also home to some of the country's best dining. Put your stretchy pants on – it's eatin' time, y'all! First: Spend an hour or two in the heart of downtown at the Charleston City Market (North and South Market Streets between East Bay and Meeting Streets). Formerly the slave markets, this series of long barns now houses stalls selling everything from jewellery to spices, shoes and handbags. Shop for traditional African items like “benne wafers”, a sesame biscuit once favoured by the slaves, and handwoven “sweetgrass” baskets formerly used in rice harvesting. You'll find particularly nice gifts at the Historic Charleston Foundation, including silk scarves, biscuit tins and period design items. Then: Ignore the dozens of same-same touristy crab shacks offering free T shirts and kids' meals, and head for Low Country Bistro (49 South Market Street, www.lowcountrybistro.com) for a sophisticated take on southern favourites like crabcake, shrimp and grits and fried chicken. Skip dessert and instead grab a bag of the famous praline from Savannah's Candy Kitchen (32 North Market St, www.savannahcandy.com), munching as you walk through pretty Waterfront Park (corner Vendue Range and Concord St), taking in the views of the Cooper River. Later: Enjoy late afternoon happy hour drink specials and one of the best views of the city at Vendue Inn Rooftop Bar (19 Vendue Range) before a short walk to one of Charleston's hippest new restaurants S.N.O.B (192 East Bay St, www.mavericksouthernkitchens.com/slightlynorthofbroad). Otherwise known as “Slightly North of Broad”, this chic temple to southern cooking uses local ingredients in innovative ways. First: Grab an espresso and a freshly baked croissant at Bull St Gourmet and Market (120 King St, www.bullstreetgourmetandmarket.com) before indulging in some retail therapy on Charleston's premier shopping strip, King Street (between Calhoun and Broad Streets). Here you'll find labels like Louis Vuitton, Gucci, Steve Madden and Nine West, as well as a number of art galleries and antique shops closer to Broad St.
Then: No trip to Charleston is complete without a meal at Hyman's Seafood Co (215 Meeting St, www.hymanseafood.com), where the walls are festooned with dinner plates autographed by adoring celebrities like Oprah, Sarah Jessica Parker and Angus Young. Nameplates on the tables show where VIP diners - from Barbra Streisand to “Jake and Elwood Blues” – enjoyed dishes like fried green tomatoes, hush puppies, crab dip and cajun catfish. Everything is super cheap (a bottle of wine for $11? Come on!) and served in ridiculously huge quantities. First: Go all Gone With the Wind and head out of town to one of the many historical rice plantations surrounding Charleston like Middleton Place or Magnolia Plantation (round trip narrated bus tours $50 to $62 via www.charleston-tours.com and www.touringcharleston.com), where you can wander through stunning landscaped gardens and magnificent restored houses and learn about the south's slave past. Then: Grab lunch at Jestine's Kitchen (251 Meeting St), an authentic fried chicken shack beloved by food guru Anthony Bourdain famous for its “Coca Cola cake” before taking a short walk to the Robot Candy Co (322 King St, www.robotcandyco.com), a mecca for sweet tooths stacked with retro 1950s lollies and memorabilia. Later: Make use of Charleston's free DASH trolley (www.ridecarta.com) which loops around the best part of downtown every 15 minutes and head to wine bar Bin 152 (152 King St, www.bin152.com) for some relaxed aperitifs before falling around the corner to Husk (76 Queen St, www.huskrestaurant.com) for dinner. Named America's best restaurant by Bon Appetit magazine in 2011, it's one of the most buzzed-about new places in America. Take note: you'll need to book at least two weeks in advance. First published on The Vine, June, 2012.